Foot melanoma is a form of cancer that spreads through the skin, starting in the skin cells that produce skin color. This form of cancer of can spread to other parts of the body under the surface of the skin and will affect the young and old. 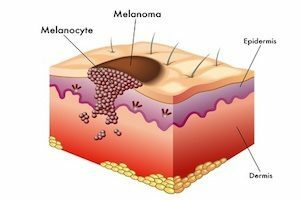 Melanoma’s most powerful threat lies in its ability to spread and grow without detection. Foot melanoma starts in the foot area, including the ankle and can go completely undetected in its earliest stages. Since it is the early stages that are most treatable, preventative care is extremely important. Foot melanoma can occur for a variety of reasons but most commonly occurs due to exposure to ultraviolet rays from the sun or tanning beds. Ultraviolet exposure, or UV exposure, can damage the skin and create abnormal cells that lead to cancerous growths. UV exposure can damage the skin whether a person spends a lot or a little time in the sun or tanning bed. While anyone can develop melanoma on any part of the body, the feet are usually susceptible because they are forgotten often when applying sunscreen. Who Can Get Foot Melanoma? Melanoma can affect anyone, including the very young. However, those that are most susceptible will be those with fair skin, including those with freckles, or people with red or blond hair. Also, people that have had to experience extreme sunburns as they grow up, or anyone under the age of 18, can be susceptible. Finally, those found to be most susceptible include individuals that have a greater number of moles than others, especially if these moles appear during childhood. Foot melanoma should be screened for by a professional since it’s so hard to detect in its earliest and most treatable stages. The most common and economical form of prevention is to wear the proper amounts of sunblock and to limit exposure to sun and tanning beds. This is especially true for people with light skin or a family history including skin cancer. Foot melanoma can go undetected or manifest through skin growths that can be blue, brown, or black, with some being white or red. Not every skin discoloration is melanoma, making the screening and detection process used by professionals even more important. The only way to detect foot melanoma, especially in its earliest and most treatable stages, is to go to a professional office, such as Michigan Podiatry, where patients can receive fast, professional melanoma screenings and treatment.